Home > News > News > Want to Sing in Our Lobby? Want to Sing in Our Lobby? 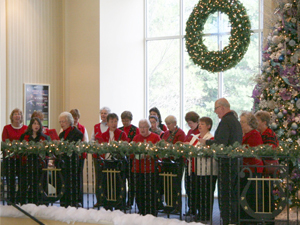 Would your group like to entertain guests in our beautiful lobby prior to one of our 2013 Christmas Show performances. Groups of any age and size are welcome to perform a cappella Christmas carols as guests are arriving for a show in November and December. Carols should be well rehearsed, and last a total performance time of approximately 45 minutes. To find out more about Christmas caroling opportunities and special discounted show packages for carolers, contact Meghan Young, Group Sales Coordinator, at myoung@AMTshows.com or 800-648-4102 x 6200.